As conservation students here at Cardiff, we learn a wide variety of skills; not only honing the techniques required to conserve objects, but those which will help us when we are fully-fledged conservators. Our degree programmes help us to master skills such as digital photography and Photoshop, we use a large range of scientific equipment, and we’re also encouraged to try different methods of communication. Through graded assignments known as Project Reports, students have created pieces such as conference reviews, posters, blogs and risk assessments in many different formats. 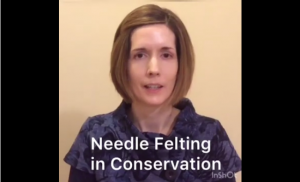 With this in mind, I decided to create a video about the use of Needle Felting in Conservation, something I have been wanting to explore for a while. Making a video was entirely new to me, but after overcoming the initial dislike of hearing my own recorded voice, I actually quite enjoyed the process and have managed to create something I’m quite proud of. Hi, I’m Mandy Garratt. I’m a postgraduate student at Cardiff University on the Conservation Practice MSc, and this is my video about needle felting in conservation. Needle felting is a craft technique used to make 3D sculptures and toys, using wool and a felting needle. A barbed needle is used to lock the wool fibres in place. A jabbing action allows the fibres to be grabbed by the needle’s barbs and meshed together, fixing the shape without the need for adhesive. How is it used in conservation? Felted patches are made using wool, plant fibres and/or hair on a backing support. These patches are used to infill areas of loss on fur, feathers, hair and textiles. It is easily reversible, simple, effective and affordable. You’ll need felting needles, a felting pad (made from foam, brushes or hessian), some wool or other fibres and a backing support such as Reemay. Reemay is spunbonded polyester, available from Preservation Equipment Ltd, and 19gsm works well. Various needle felting kits are available online, ranging from five pounds to 35 pounds. You can buy many different types of felting wool, using animal, plant and synthetic fibres (dyed or undyed). Once you’ve mastered the technique you can experiment with different types of fibre to achieve to right texture, colour and appearance for your gap fills. To begin, cut a piece of your backing support (in this case Reemay 19gsm) to the shape and size of the patch you need to create, and place it on your pad. The example I’m going to show you is for a long-haired patch, like this one. To prepare the wool, take a small piece of wool from the ball, by grabbing firmly with one hand and then using the other hand to gently pull a section out. Tearing the wool creates a more natural effect than cutting it would do. If the piece is too long, then fold over the top as many times as required and then hold it in place on the pad, ready to start. Hold the wool firmly in place, then take a needle and start jabbing the wool, being careful not to jab your fingers! You can wear leather finger cots to protect against stabs, or just be careful not to stab them. If you’re doing a long-haired section like this, you won’t need to jab it quite so much as if you were doing a shorted haired or more felted patch. Here, I’m just jabbing it a few times to anchor the wool into the Reemay support. You can achieve many different effects, using either the front of the patch or the back for your infill, depending upon the desired result. The patch will often stay in place just using the friction of the fibres beneath the support, but a little adhesive can be used if required. I’ve really enjoyed practising the technique and I’m looking forward to using it soon. Happy felting! The Needle Felting technique as used in conservation was developed by Natalie Jones, a Natural History Conservator at Cambridge University Museum of Zoology. Natalie posted an excellent thread during Icon’s Twitter Conference of October 2017, which shows examples of what can be achieved. All footage, images and words used in the above video were created by Mandy Garratt in 2019.